Quesadillas are a satisfyingly simple dish. To simplify down – and REALLY simplify down, what they can be described as; they are a Mexican version of grilled cheese. They are so much more than that, the tortilla crisps up really nicely, and does not require oil in the pan, or butter to get the crunch and crispiness. So much so, that you could make this recipe in the oven or under the grill if you wanted to. 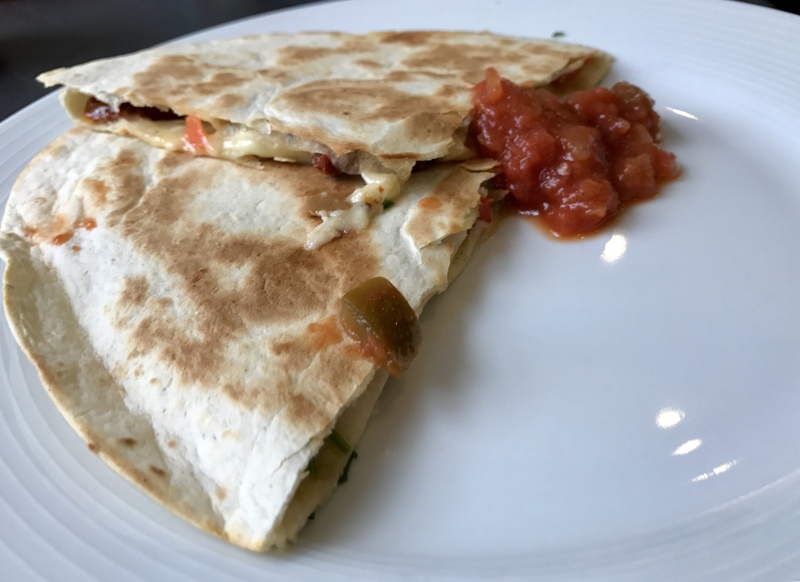 This recipe is not a classic Quesadilla recipe, and probably never eaten in Mexico, but it is yummy all the same. A lot of punchy flavours are in here, so if you are fainthearted for flavour, maybe this is a no-go. I do mean that, I have moments when I want something a bit more bland, but this does not fit that bill. The sundried tomatoes and mature cheese do compete for flavour, but they compliment nicely here. The red pepper adds a bit of texture and sweetness to the salty cheese and tomatoes. The coriander adds, well, coriander. I have a substitution chart below if you do not want to have coriander, and want to change up your cheese options. This recipe may look basic, and unimpressive, but it is ideal for a simple lunch at home. The flavours are good, but if you are looking to impress people with a gorgeous dish, this is probably not the best recipe to attempt. I found the flipping to be difficult, and making the recipe harder than originally planned. If you don’t properly toast and support the Quesadilla before flipping, then it will fall apart. Do not get me wrong, it still tastes good, and the possibility should not deter you. Extra mature cheddar cheese Manchego cheese (it will give a stronger Spanish feeling) Smoked Applewood. The smokiness of the cheese will compliment the flavour of the sundried tomatoes nicely. Fresh coriander Pesto (if you are going to go down the pesto road, I suggest using mozzarella as your cheese) Fresh / dried thyme. You can add some lemon on top to enhance the thyme seasoning at the end. Difficulty : Medium - if you want it to look good. This is a great weekend cooked lunch, or for those lucky people that have hob access mid-week, a weekday lunch as well. The flavours of cheese, sundried tomatoes, red prepper, and coriander are fresh, but also indulgent and melty. I find this lunch satisfies multiple cravings and is quick enough to get it out the door. Step 1 Ensure that you have a frying pan large enough to hold a tortilla flat on the bottom (no going up the sides). You don’t want to start making this recipe and get a surprise at the end). Step 2 Chop and prepare all of your vegetables – you should ensure that your pepper is chopped into chunks that are quiet small. Note – if you like your red pepper on the crunchier side, make the chunks a little bit larger. Chop you sundried tomatoes into small bites as well. When you eat this, there is a chance that you will not be able to bite through the sundried tomato, so rather than being annoyed with your lunch afterwards, chop it small now. Step 3 In a dry pan add your first tortilla, turn the heat onto medium / low, and first smoothe your garlic paste onto the bottom of the tortilla. Step 4 Once you have completed that, place the rest of your ingredients into the pan. Step 5 Leave the 2nd tortilla off the top for a bit, and instead put a lid on your pan to help you start to melt your cheese. You want to leave this toasting / melting for approximately 5 – 7 minutes. Keep an eye on the bottom tortilla to ensure that it is not burning, if you feel that it is toasting too quickly and your cheese and toppings are not melting fast enough, turn your heat down. Step 6 Add your second tortilla to the top, and press in to the cheese to ensure that it will remain together. Step 7 Check the bottom tortilla, and when you are happy to flip, go for it! I am not the most graceful of cooks, and used 2 spatulas to help support the bottom, and still managed to have it break apart. Use whatever you feel the most comfortable doing. Step 8 Once flipped leave your quesadilla on this side until you are happy with the colour of the toasted tortilla! Again, about 5 – 7 minutes. Step 9 Chop your tortilla into quarters, and a serving is 2 quarters per person. Serve immediately and enjoy.